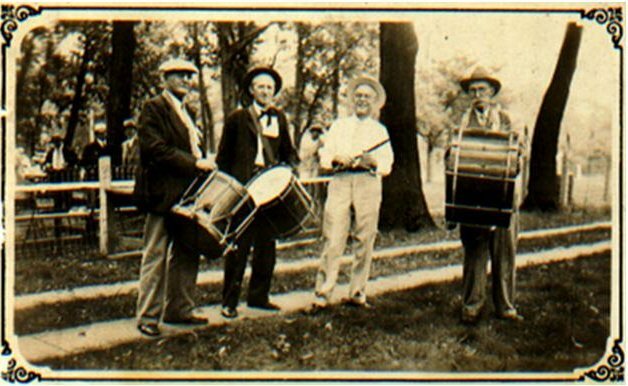 For many years Albert Lane beat the bass drum in the Elk Run Drum Corps, which brought martial music to quicken the pulses of the early settlers at their annual picnics. His co-musicians for this martial treat were: Dr. John Evans, New Hartford: M. A. Parsons, Volga City, and Rev. Fred P. Fisher and Frank Barron, Waterloo. As a small child I remember seeing my great-grandfather in Waterloo Parades playing with the band on a flatbed truck; he was very old. I followed in his footsteps and was the West High school bass drummer in 1949-1950.